We must consider Jesus in His humanity to fully understand the power of this Gospel. Jesus knew that He was the Messiah. He took the name I AM for Himself, declaring His divinity and therefore sealing His death. We have to remember that He did this as a human being who felt fear. What gave Him the power? It was through His understanding of and capacity to enter into the mystery of love that He found the ability to assume His mission. That doesn’t mean it was easy. 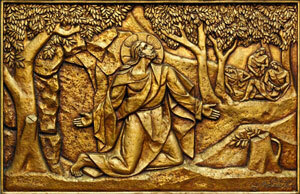 We have to remember the agony in the garden the night before His death. But He did find the power to love when it meant “to give your life for your friend”! For us today, love can seem so demanding. Love demands that we accept dying to our own will in order to live for others. We can look upon the cross of Jesus and see the price of true love. And even more important, we can contemplate the Resurrection and see the victory that belongs to the one who loves and the true life that can be ours.